Whether you've got the skateboarding skills to become the next Tony Hawk or you're still just a determined beginner, this snazzy skateboarding temporary tattoo will help boost your street cred and show how your passion for the sport runs deep. Bright colors mingle together and create a design that'll instantly get noticed. 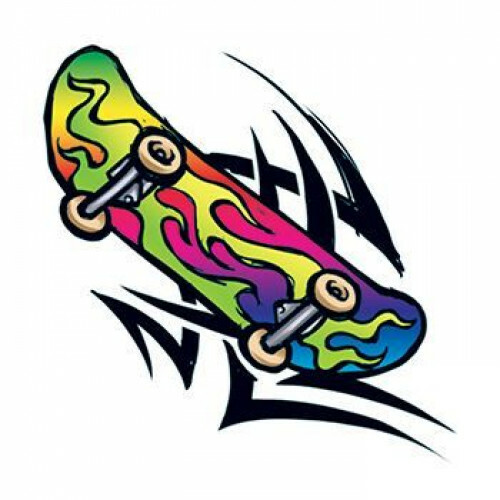 The multicolored skateboard is placed against a cool wave design that adds a rugged look you and your friends will love. If you're not a skateboarder but you know someone who is, why not delight him or her with this modern design that's pleasing for all ages? The temporary design is easy to apply and it removes cleanly, too. Size: 1.5 x 1.5 in.